Hyper-hectic carnage and freedom simulator Broforce has just been struck with a new Early Access update, and it’s a big ‘un. New bros, more missions, a whole new region to blow up in the name of America and Steam Workshop support have been chucked into the game. Brodical. The new bros are Bro Max, a post-apocalyptic road warrior wielding a boomerang and a shotgun, and The Brode, driven by vengeance and squeezed into a hideous yellow jumpsuit. These extra bros can join their buddies in bringing freedom to a new land as they travel to Eastern Europe for more campaign missions for you to play as a solo bro or with your best bro buds. 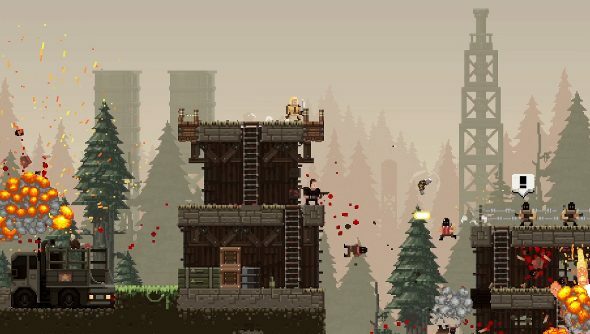 Celebrating democracy, Broforce now has Steam Workshop support too, so patriots can make their own explosive maps and other patriots can rate them. Time to see if I can make an entire level out of explosive barrels. That’s how you deal with Communism.